Are humans unique? This simple question, at the very heart of the hybrid field of biological anthropology, poses one of the false of dichotomies—with a stereotypical humanist answering in the affirmative and a stereotypical scientist answering in the negative. 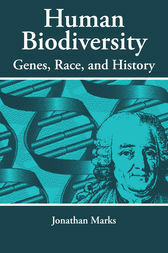 The study of human biology is different from the study of the biology of other species. In the simplest terms, people's lives and welfare may depend upon it, in a sense that they may not depend on the study of other scientific subjects. Where science is used to validate ideas—four out of five scientists preferring a brand of cigarettes or toothpaste—there is a tendency to accept the judgment as authoritative without asking the kinds of questions we might ask of other citizens' pronouncements.